How big is the ICO (aka token sale) market really? It seems like this should be an easy question to answer. After all, blockchains are open data layers that contain a complete record of every transaction ever made. However, we’ve found the answer to this question to be surprisingly elusive. We surveyed the web for data on token sales and turned up over 100 ICO listing sites. Estimates on the total dollar amount that has been raised via ICOs to date range from about $3.5 billion to $4.5 billion. Why such a big discrepancy? As far as we can tell, all of these estimates rely strictly on reported figures — either by the ICO issuer itself or by another third party. There is nothing wrong with this approach. Many data providers in the financial world collect their information this way. However, why rely strictly on reported figures when the actual transactions are available directly from the blockchain? We decided to estimate the size of the ICO market ourselves by going directly to the source. The figures in this post are based on our own deep dive into the Ethereum and Bitcoin blockchains. We searched for every token, crowdsale, and multisig wallet we could find. We then identified the corresponding owners and added up the total amount of contributed funds — taken either from the blockchain itself or as reported by the fundraiser. In total, we estimate about $6.4 billion has been raised via ICOs to date – materially larger than what is being reported elsewhere. Perhaps more surprising than the fundraising total is the trend over time. The ICO market is not dying down, as many have reported. It’s still growing. This chart is a labeled version of the one at the top of the post. It shows the ICO fundraising amounts by month. 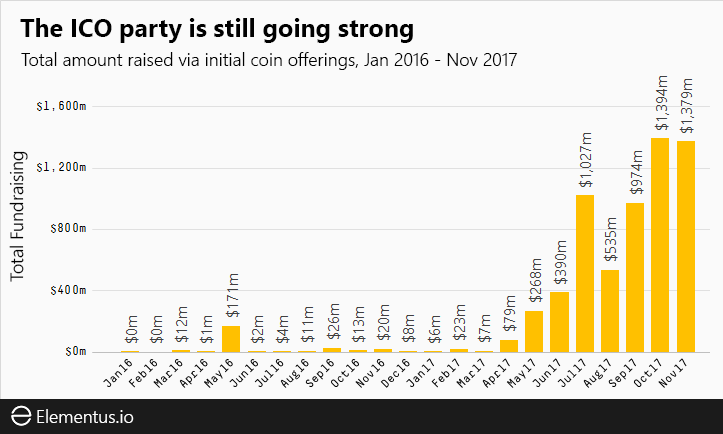 Contrary to the commonly heard narrative that the ICO party is coming to an end, ICO fundraising in November was only slightly off its high point the month before. The current run rate of over $1.3bn per month surpasses traditional early stage fundraising by a multiple. Angel and seed-stage VC investments were running at less than $300 million per month as of July (Goldman Sachs via CNBC). The trend is even more stark when you look at the total count of ICOs that closed each month (minimum raise of $100k). By this measure, the token sale market is not only still going strong. It’s accelerating! November set a new record for number of closed token sales with 148, an increase of 36 compared to the month before. We view this metric, the number of token sales, as a better gauge of market activity than the fundraising total. The total dollar amount raised is not only susceptible to fluctuations in crypto exchange rates, it may also be driven by just a handful of outliers, rather than the true underlying trend. For example, just two ICOs (Tezos and EOS, which raised $236m and $200m respectively) account for nearly half of July’s total fundraising. 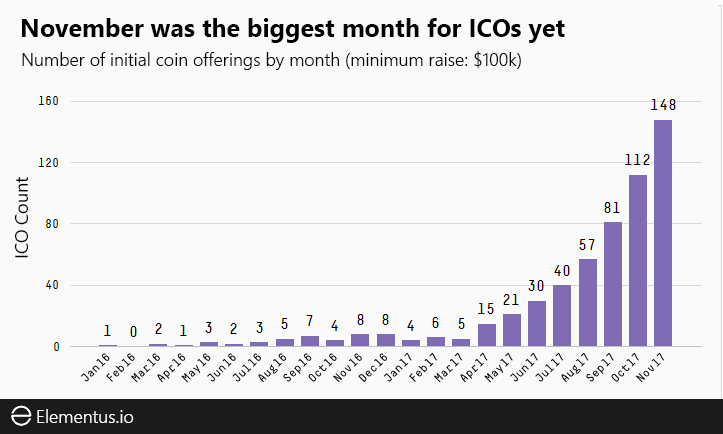 The number of ICOs completed each month shows a much clearer trend, and one that shows no sign of slowing down. To play around with the graphic yourself, click here to view the interactive bubble chart.